Skenz1&2 brings to you another beautiful and lovely praise and thanksgiving song "YAU" (Today) featuring one of BLW's finest if not the best! He's called #YoungRuler #‎MrPresident #SonOfJamgbadi, Mr Sam Jamz as we all know. There's this uniqueness when he drops his rhymes. Bringing Sam Jamz on this song gives it a different feel one cannot explain until he or she listens to it.
" ‘YAU’ is a beautiful Hausa song which many maybe familiar with the chorus, but we decided to do it in our own way/style and you have to listen to understand exactly what we mean.. We are saying THANK you to Jesus for bringing us this far and still keeping us going.” says Skenz1&2. 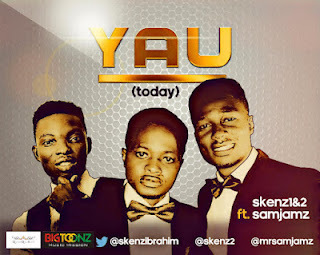 "YAU" (Today) is produced by J Rocks, mix, mastered and guitars by the renowned Iyke Onka so we invite you to come THANK GOD with us as Bigtoonz Music presents Ibrahim & Oumar (Skenz1&2) yet again!